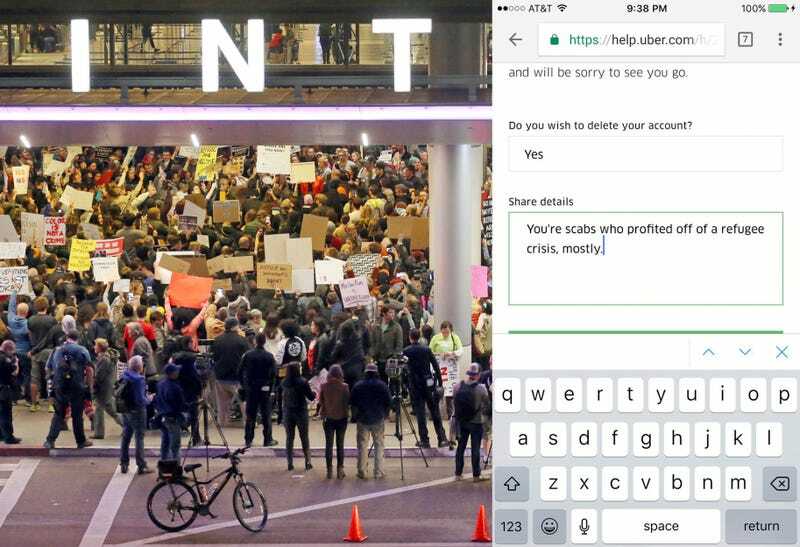 #DeleteUber is trending on Twitter after the notoriously scummy ride-hailing app broke a strike and undercut taxi drivers’ protest of President Trump’s refugee-detaining executive order. Once more, Uber reminded the country that it’s a scum company. Last night was an excellent example of how not to act in the face of the Trump administration. What to do: swiftly organize, protest, and strike. This is what taxi drivers did in New York City, and it worked. U.S. District Judge Ann Donnelly issued a stay on the White House’s executive order hours after the protest started. What not to do: issue a wimpy statement not backed up by action. That’s what Uber did. The company’s CEO (who has the ear of Trump) sent out the following email, which on the face of things is pretty progressive. Yes, he really said “it’s the magic of living in America,” without anything to back up his feelings. Five hours later, Uber tweeted that it had “not meant to break strike” with a link to the email above. Here are some quality tweets. There are many more of these tweets, and I encourage you to take a quick Twitter search for your mental health. And again, keep this all in mind over the coming years of the Trump administration. Don’t think that a toothless statement is enough. UPDATE: while Lyft straight up gave $1 million to the ACLU, Uber has promised a $3 million fund for the pro bono legal protection of any Uber driver affected by the ban, as The Verge reports. Great! Uber also told Motherboard reporter Sarah Emerson that it had no idea how exactly drivers will be compensated, and that the company was not strike-breaking as its tweet was sent out after the official strike ended. As one of the above Twitter users pointed out, it was not the tweet that broke the strike, but the drivers. Moreover, the lack of a tweet advertising low rates during the strike does nothing to disprove how Uber broke the strike itself.